“The Favourite” exposes the wicked and ribald high jinks behind palace walls. 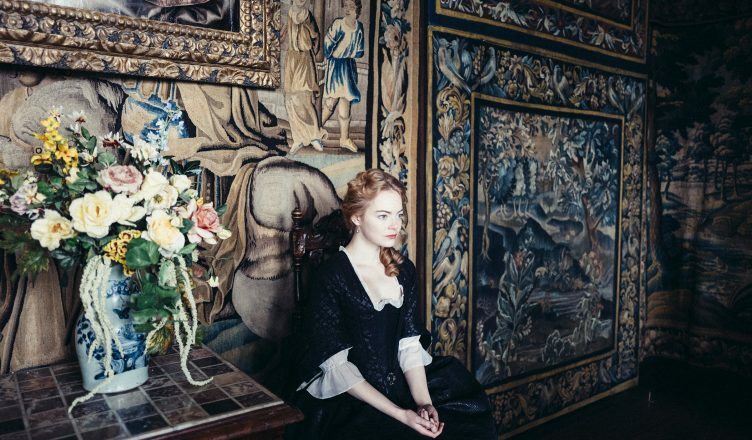 Often known for his surreal and outlandish cinematic pieces, director Yorgos Lanthimos helms a new period comedy-drama, “The Favourite.” Set in the 18th century during Queen Anne’s reign over Great Britain, “The Favorite” focuses on two women’s bellicose rivalry as they claw for power and attention from their majesty, Queen Anne. Rife with twisted schemes and tense hostility, the film emanates outre and chilling tones that are right up Lanthimos’ alley, giving the audience a toxic yet fathomable look into those who are willing to acquire prestige by any means necessary. Historically, the real Queen Anne had a bad reputation; she was labeled by historians as a sickly and unsuitable successor for the throne of Great Britain. “The Favourite” comically emphasizes these negative traits to showcase how out of touch Queen Anne (Olivia Colman) is with her country’s politics, as her incompetence and unkemptness is only handled by her advisor and right-hand woman, Sarah Churchill (Rachel Weisz). Among bumbling aristocrats, Sarah keeps the palace running like a well-oiled machine with her secure position of power. However, Sarah’s cousin Abigail Hill (Emma Stone) unexpectedly arrives to interrupt this status quo. Having been stripped of her nobility, Abigail initially sits at the bottom of the socioeconomic ladder. However, using her wits and charm, she gradually clambers her way to the top in order to make a stable living. As she attempts to usurp Sarah’s standing as the queen’s confidante, the movie branches into heated drama, diabolical acts, and lovers’ quarrels. Visually, the film is stunning. The camera captures the opulent interior filled with spacious chambers that consist of bluish-grey hues and wooden corridors, giving off a cold yet palatial atmosphere. Each location seems standoffish and unwelcoming, paralleling the nature of the characters. The queen’s room is also distinctly laced with gold-patterned tapestries and ornate baroque walls as if to flaunt her exclusive monarchal lifestyle that feels isolating yet luxurious. Many shots of the characters are at low angles to seemingly exhibit a theme of superiority, tying back to the adversaries attempting to outshine each other. Even the choice of orchestral music, involving nimble string plucks or raspy violin scratches, heightens some prolonged, disorienting angles. Without a doubt, “The Favourite” has its own histrionic flair. The aristocratic setting is juxtaposed with the sordid lifestyles of those living in high authority. Officials participate in hyperbolized buffoonery, such as duck races, pie throwing, and extravagant dancing, which can be flummoxing to the audience. But their high-class antics exude a satirical element that makes certain scenes ridiculously funny and off-putting. These absurdities show the audience the time-wasting nonsense these higher-ups indulge in. In many ways, the battle for dominance between Abigail and Sarah relates to survival of the fittest. This is particularly seen through Abigail’s character, who starts to become more tenacious and hard-headed in a deluxe dog-eat-dog world. But Abigail grows manipulative and power-hungry as she attempts to win the queen’s affection. She uses chicanery and licentious ploys, which seem to speculate on the real behind-the-scenes world of a lavish, regal era. As much as Abigail’s actions are for self-gain, they are also self-sacrificial. The audience sees how her inclusion in the narrative readjusts the cordial bond between Queen Anne and Sarah. Abigail’s presence catalyzes each character’s downward spiral toward avarice and envy, the story’s key themes. Ironically, the three characters’ ugly relationship is acted beautifully by the three lead actresses’ cohesive performances. Emma Stone’s natural charisma in playing an underdog-turned-victor is fascinating as she depicts Abigail’s playful and villainous sides. Clashing with Stone’s Abigail, Weisz’s Sarah is stern and headstrong with moments of emotional weakness. Finally, Colman’s Golden Globe win for Best Actress for playing Queen Anne is justified for the brilliance of her portrayal of the monarch. Colman acts with a facetiously temperamental, spoiled disposition that also masks the queen’s aching, lonely heart. Witnessing this pitiful duality in her character, the audience is left repulsed yet sympathetic towards her. In fact, the three women all have layered, three-dimensional personas filled with blemishes, vulnerabilities, and contradictions, which make them feel all the more rich and alive on screen. “The Favorite” is a niche cinematic piece, but it keeps the audience interested with its imperfect characters. It triangulates between three flawed yet resilient women, and the actresses’ performances as such are transfixing. It is a wicked and giddy story about power struggles and isolation, giving the audience a glimpse into the farcical, perverse, and doleful acts that ensue in a place of seemingly worthy standard. “The Favorite” is memorable in its visuals and narrative, having viewers enjoy the mischievous spectacle that unfolds before them.